Anna Travis is back in a new gripping mystery from Lynda La Plante, featuring the female detective every bit as intelligent, ambitious, and flawed as Prime Suspect's Jane Tennison.Ruthless drug trafficker Alexander Fitzpatrick is one of the most wanted men in the Western Hemisphere. But for ten years, there's been no sign of him. 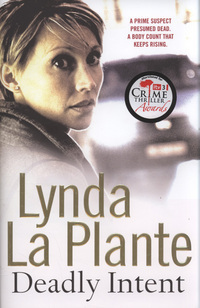 Is he dead, or just trying to appear that w Anna Travis is back in a new gripping mystery from Lynda La Plante, featuring the female detective every bit as intelligent, ambitious, and flawed as Prime Suspect's Jane Tennison.Ruthless drug trafficker Alexander Fitzpatrick is one of the most wanted men in the Western Hemisphere. But for ten years, there's been no sign of him. Is he dead, or just trying to appear that way? When an ex-colleague from the murder squad is found shot in a dank drug den, Anna Travis is pulled into the case. She's grateful for the distraction after her breakup with DCI Langton and soon finds herself involved with someone new. But as the bodies pile up and the mystery deepens, Travis and Langton must put aside their personal history and work together to track down one of the canniest criminals they've ever encountered.